Wouldn't it be lovely to wake up on a Saturday morning to a pot of freshly brewed coffee and warm pancakes that could be enjoyed in this delightful kitchen? The little table is well positioned by the window to make the most of the natural light and the bold green chairs echo the glimpse of greenery seen outside. As for the navy and sky blue linens under those pancakes? I would snap those up in instant! What are your plans this weekend, friends? I'm heading over to my friend Rachie's for dinner and really need to start my Christmas shopping. Have a good one! Have a great weekend! My weekend plans mainly include decluttering- it gets addicting! Ah you keep posting such fabulous painted chairs, and now I want to paint mine! I have 6 very drab yellowy pine chairs that are crying out for a lick of paint, damn you for plating evil seeds! Those chairs are fab. Amazing what a lick of paint can do! Happy weekend- love the hit of green! 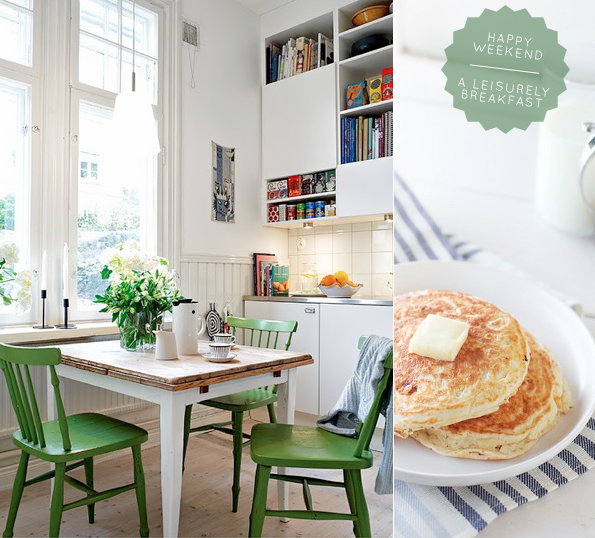 Love this cheery kitchen and the green chairs add just the right pop! Hope you have been enjoying your weekend Will!!! !